Fiction – paperback; Quercus; 400 pages; 2007. Crime novels set in modern day Australia are few and far between. In fact, I’ve never read one before. 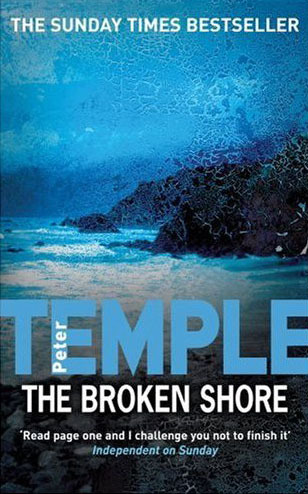 But then I heard lots of good things, mainly from British critics, about Peter Temple’s The Broken Shore and knew it was a book I had to track down. I picked up a cheap copy from Waterstone’s earlier in the year and read it over the course of a dismal weekend in June. The book was absolutely enthralling in a way I could not put my finger on. And because I couldn’t quite work out what it was about the book that I loved so much I couldn’t muster the creative energy to write a review. I then gave the book to my father, who was about to embark on a long haul trip back to Australia, and kept telling myself I’d write about it … soon. Well, two months later I’m finally composing this review-of-sorts. Since my reading of The Broken Shore, it has been awarded the Duncan Lawrie Dagger (formerly the CWA Gold Dagger for Fiction) for 2007. Temple, who was born in South Africa, is the first Australian to win the award. But while it might have scored a top-class prize for crime writing, I’m not entirely convinced that this book is a conventional crime novel. The first half is very heavy on scene setting and character development and there’s little in the way of detective work. But this is not a bad thing, because you get a real sense of what makes Joe Cashin — and the rural community in which he lives — tick. I enjoyed the slow sense of build-up, the careful exploration of Cashin’s current life interspersed with the occasional flashback of his troubled past. You get a real feel for the man: his decency, his pain, his professionalism and his solitary nature. Temple also interweaves some interesting political and racial problems into the storyline without resorting to cliche, although the picture he paints of rural Australia (and its police force) isn’t exactly the one that the tourist brochures will want you to see. The urgency of the plot picks up in the second half — and goes off in unexpected directions. I’m not sure it entirely works, as there were elements that I found slightly unbelievable, almost as if Temple was trying too hard, as if he wanted to shock the reader and bang them over the head with the sheer outrageousness of it all. Australia, and in particular Vctoria, is now well-served by modern day crime novelists. Peter Temple is the most obvious example, but don’t forget about Garry Disher (with his Inspector Challis novels set on the Mornington Pensinular) and Shane Maloney (with his Murray Whelan novels set in Melbourne mainly involving state politics). Both of these other writers are well-worth your time seeking out. I returned this to the library yesterday, two chapters read. It was just too bleak for me, but reading your review, it makes me think we were reading 2 different novels! I’d like to pick it up again one day when I can handle the grimness. It’s a shame, as I wanted to try more Aussie authors this year. Perry, I’ve never read any Disher (I thought he was a children’s author — I remember him doing book signings when I worked at the Myer Bookstore back in the early 1990s) or Maloney. Must hunt them out now. Can you recommend any particular titles? With Maloney you’d best start with the first Murray Whelan novel, “Stiff”. That will give you a good indication of his sense of humour, and, let me tell you, he is very funny. I don’t chuckle over many books but I do over Maloney’s. Which reminds me that I have to update this page with his latest novel. In both Maloney’s and Disher’s novels, as in Temple’s, the Australian locale plays a major part in the book. It will make you even more homesick. He’s got it all covered. I agree that Temple convincingly depicted rural Australia, and really enjoyed this novel. I’m saddened to say I found the plot believable (and even predictable). for me an organisation of male businessman helping troubled young men is automatically suspect. I love Shane Maloney’s Whelan novels and I think you will lap up the Melbourne references. The first two have been filmed as telemovies with David Wenham as the hero. I didn’t know Disher wrote adult fiction either – I’ll have to check him out as I like his kid’s stuff. You know what I think of Temple. Disher’s novel “The Sunken Road” was submitted by his publisher for the Booker Prize back in 1996. That was the year of “Last Orders” by Graham Swift. It’s pretty good and might have been in with a chance of making the longlist – if they has them back then.